It’s no secret our grandparents view the world differently. If you’re like the majority of people, your grandparents or great grandparents lived through the Great Depression. The financial lessons they learnt during that harsh time are a legacy worth sharing. I only knew one of my grandparents and, as the Great Depression made its way across the Atlantic to Great Britain, she was a young mother with two small children. She also had the added challenge of her Merchant Navy husband being absent for long periods. I can’t imagine how hard that must have been for her but I know it probably helped forge the fiercely independent woman I knew and loved. 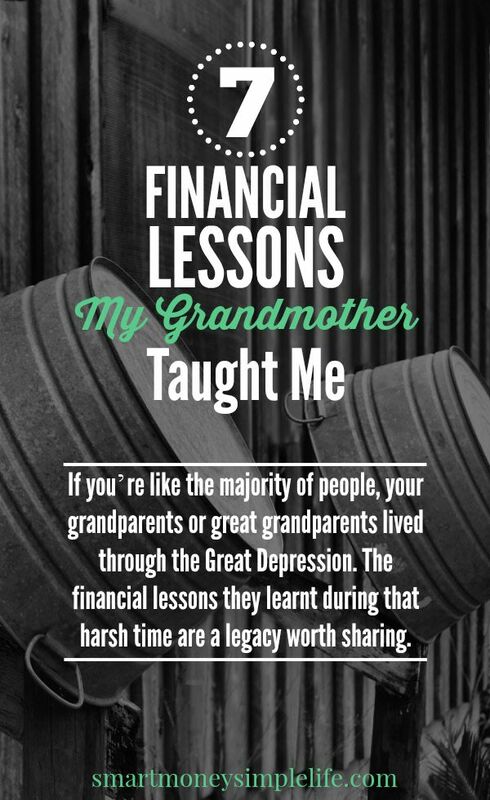 I was lucky to have been able to spend time with my grandmother learning the many life and financial lessons she had to share. Some I’ve learnt well, others I’m still working on. As Mothers’ Day is this Sunday, I thought I’d honour her memory by sharing some of those financial lessons with you. My grandmother never used credit. Ever. She only paid cash. If she didn’t have the cash, she didn’t buy it. Plus, despite living on an old age pension, she was always able to save. She was a classic example of ‘it’s not what you earn, it’s what you spend, that matters’. When you value your belongings and consider them investments, you take care of them. Nowadays, it’s seemingly cheaper to throw it away and replace it than it is to repair it. That goes for everything from socks to power tools. My grandmother took care of all her possessions because she valued not just the item but the money it took to purchase it in the first place. My grandmother grew up on a farm and like most women of her generation she knew how to do and make a great many things that we now outsource to industry. She could knit and sew, milk a cow, garden… you name it, she could do it. She also used some of those practical skills to earn a little extra money and keep herself busy right into her 80’s. Of course, my grandmother never called it an emergency fund, to her it was ‘saving for a rainy day‘. And, it was a priority. She knew that having money in the bank was insurance against adversity. There’s a great ‘allotment garden‘ tradition in England that’s still very popular today. My grandmother knew that a productive kitchen garden ensured you always had plenty of fresh vegetables available, regardless of the state of your budget. Good food is the foundation of good health. We’re constantly bombarded by advertising… It’s no wonder we can’t distinguish between a want and a need. Everything seems to be a need. Being able to make this distinction can mean the difference between living well with money in the bank and living from pay cheque to pay cheque with a mountain of consumer debt looming over you. Like knowing how to discern the difference between a want and a need, my grandmother also knew that sometimes the real luxuries were the little things in life: taking time out to enjoy a sunny day, fresh flowers in a vase, a special dessert. Not a Prada bag or luxury cruise in sight! I’ve weathered a few financial storms during my life and I hope that, like my grandmother, I’ll be able to pass on some of the wisdom I’ve acquired (the hard way) along with the wisdom passed to me, to my own future grandchildren. What financial lessons will you pass on to your grandchildren? Which of those financial lessons are ones you’ve learned the hard way? All good advice. When I think back to my Grandma, I know I picked up a lot of her frugality. She hardly ever spent a dime yet she passed away with hundreds of thousands of dollars to her name. People who lived through those Great Depression times just had a different outlook altogether on what to do with your money. Really great tips that everyone should read. Something we all must understand is needs vs wants and we have to teach our kids that. True. Trouble is, the advertisers are very good at confusing the issue. It’s worth the struggle though. Great article. People tend to justify using a credit card under the guise that it will be necessary in case of an emergency. Why not just build an emergency fund instead? An emergency fund is a must, but credit cards can still be useful… when you don’t carry a balance. That’s just very expensive debt. Hi Diane – What a wonderfully written post. I teared up reading this as it made me think of my grandmother. I can still hear her saying almost word for word what you wrote here. Thank you for sharing. You’re very welcome, Felica. And, thank you. I’m so glad this piece struck a chord with you. Grandmothers are real treasures. I love these so much, they are the things that I grew up watching my grandma’s do. Now I do them myself and am teaching my children to sew, cook, and preserve. One big things I learned from my grandma that I do everyday is to never use my dryer (I do for socks and underwear, but I don’t tell her), she would always hang her clothes to dry. Inside, on a drying rack, or outside on a line. According to her they always last twice as long that way and you get to enjoy the sunshine while hanging them. I guess the message here is: lead by example. Unfortunately, we did not learn that way. We grew up in a life of abundance and unimaginable luxuries. Our parents both came from well-to-do families. Both of them did not have the word “save” in their vocabularies. All this came to a sudden halt when tragedy struck. I was ten then. My Mom was the hardest hit as she had to keep all eight of us afloat. By herself. Genteel Poverty is what writer Isabel Allende calls it. Incredibly, she weathered the storm very graciously and, seeing how she was quietly hurting I vowed I would never go through that again. That is the answer to the question “why”? Among all my siblings, I earn the least yet I live a very comfortable, modest life. We built our own home from scratch (from cash we savedover the years), my husband and I pay the fulll amount on our credit cards (one card each only) , earning points as we use the card, we travel locally and internationally yearly, etc. They tease me about my frugality but I always counter that I do not at all feel deprived. It is a matter of balance and priorites. I fulfill my obligations, I give to charity and I still always save. Also, I sleep very well at night. And, I always take the opportunity to teach anyone, whether it is my workmate, or my household help or my siblings and and their children that frugal is responsible. Diane, thank you for the great article. I’ve spent a lifetime slooowly (very slowly) learning some good financial habits. No. 1 for me is no credit. I’m not including a mortgage in this as mostly it would be impossible to buy a home without one, but even so it’s possible to keep the cost down. For example, do you really need that house with those very large rooms? Do you really need that number of bedrooms? Could you buy small with some outside space to expand later, when you’ve saved? (more fun and so much, much more satisfying that way). I agree with 20 something lawyer – credit card debt is a very expensive debt, which brings us neatly back to point 1. No Credit. Or to put it another way, if you don’t have the cash for it, don’t buy it. A difficult rule to live by, I know, and not always possible. But if that rule is applied as often as possible, it can be suprising how much difference it makes. To Thegiftsguy (you seem so sweet) it needn’t be confusing – teach yourself to (horror! blasphemy!) dislike advertisers! ; anything you need or want you can recognize independently out of your own day- to- day experiences. You don’t need to allow some stranger who does not have your best interests at heart to suggest what YOU need. You’re capable of knowing that yourself; and with that realisation comes a sense of freedom which once experienced, you’ll love forever. And to Cara (whose mother must have been a wonderful, courageous woman), I agree wholeheartedly…being able to sleep at night, debt free, is a wonderful thing. We may not completely achieve this Nirvana, but by striving for it, by making changes in our spending habits, we can achieve more peace of mind, not more worries. I hope I don’t sound too preachy, but Diane’s article inspired me to express some of the lessons I’ve learned over 6 decades! Thanks for reminders, some I have and will never forget. Others are still there but need to be refreshed. I don’t think I have completely forgotten but do need a kick-start sometimes. The basic rules I try to live by are the words of the Bible that my grandmother taught me and the use of our hands. Thanks for your message.